From the moment you walk into Daphne’s welcoming living room, with its multi-lingual library and vintage musical instruments, you will feel as if you stepped into a friend’s beautiful summer house. Here all is conceived to make you feel at home: the 11 fully-equipped comfortable and sunny apartments with private balconies, the free WiFi and bicycles, the amazing baby amenities and of course the hotel’s beautiful garden, which practically borders the pretty beach and the seaside pine forest. Here, in the company of your hosts and like-minded guests, you can finally truly relax and enjoy your holidays and your family. 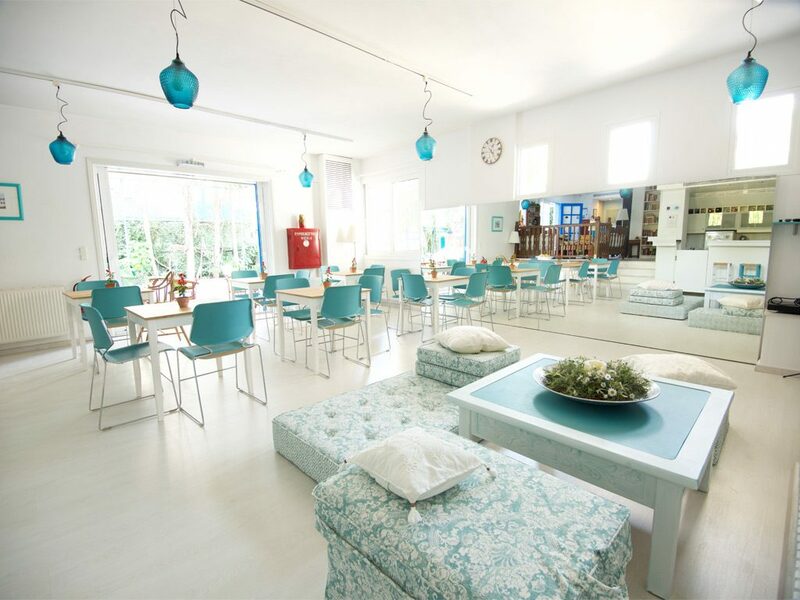 In short, authentic cosyness and true hospitality in Greece’s first eco-labeled family hotel! Daphne’s Club Hotel Apartments opened in 1996 as a family owned small hotel apartment complex, created by George and Chloe Mavrommati. 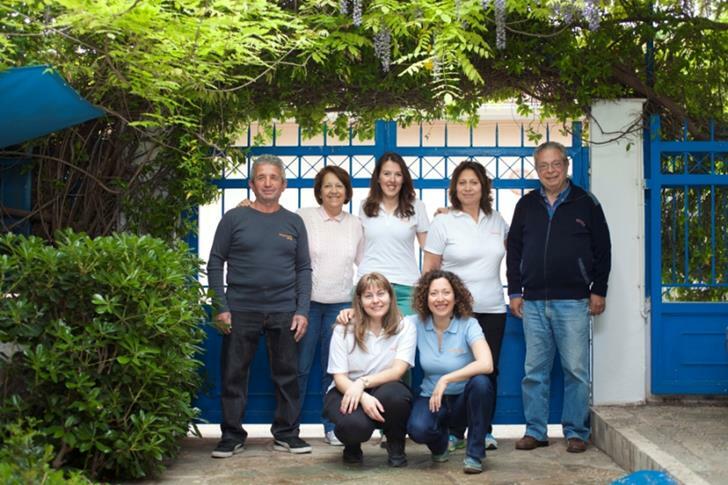 It is now run by their daughter, Daphne, along with the hotel’s able personnel, Dimitris Mitrou, Tinka Atanasova, and Evaggelia Aspropotamiti. In 2006, after 10 years in the accommodation sector, the family decided to venture further into the hospitality business, by opening up its horizons to other related services, such as the hosting of business meetings and private and corporate events and the organisation of individualised cultural excursions and thematic workshops. At the same time, the family committed itself to an environmental policy, aiming to alleviate the negative effects of human activity in its small corner of the planet. Alexander, the family’s fourth member and a professional skipper and snowboard instructor, is exploring the opportunities offered by the sea and the mountain. His aim: to take hospitality deeper and higher! His latest project: Sublime Sail Trips. 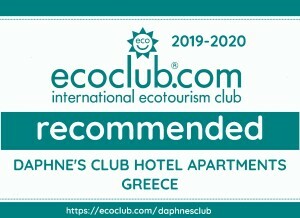 In 2005 Daphne’s Club signed up to the Green Globe 21 environmental benchmarking and certification programme, with a view to becoming part of the global movement for sustainable tourism. Inspired by this scheme we created our Environmental and Social Sustainability Policy. In February 2008, we submited our first energy and water consumption data to Green Globe 21. Click here to download our benchmarking results. During 2007 we also became interested in the EU environmental certification scheme “Ecolabel” (the so-called “flower”). In March 2008, we submited our application for the European Ecolabel. 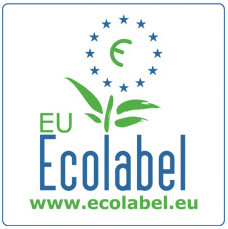 In December 2008 we were successfully awareded the European Ecolabel. 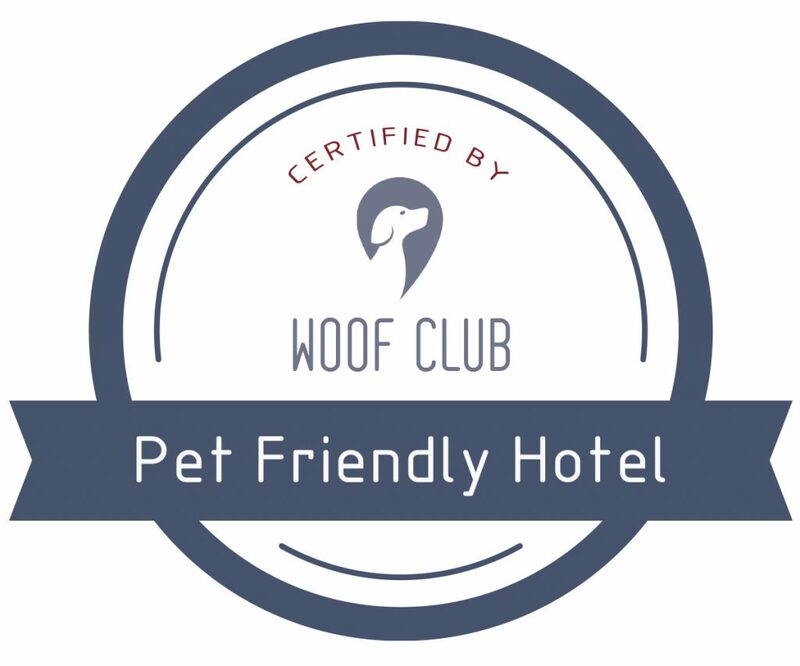 We renewed our certification in 2011 (available in Greek here). After its expiration we did not submit a new application for certification, as the cost was too high, both in financial terms and in terms of the bureaucratic procedures involved. 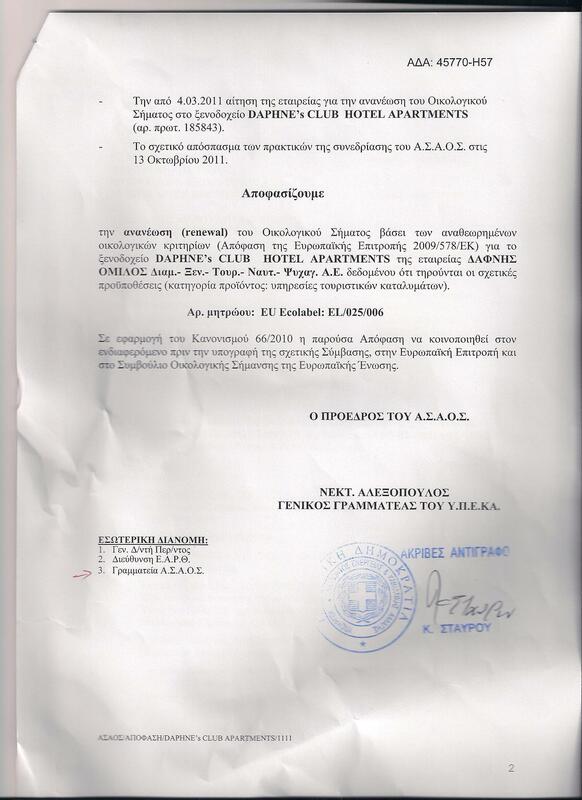 In June 2010 Daphne’s Club Hotel Apartments was awarded the international ecolabel “Green Key “! 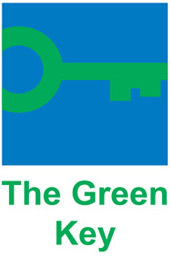 The Green Key® is a worldwide available eco-label awarded to leisure organisations, such as hotels, youth hostels, conference- and holiday centres, campsites, holidayhouses and leisure facilities. To obtain The Green Key the company has to fulfil a list of environmental requirements. These requirements are contained in a number of criteria. Besides environmental demands (for example to control the production of waste and the use of water, electricity, etc. ), the criteria include demands on policy, action plans, education and communication. Obtaining The Green Key shows the sense of responsibility a organisation has for its surroundings and society. We continued applying and successfully obtaining the Green Key certification until 2016. In 2017, due to the financial cost and bureaucratic procedures involved, we discontinued the Green Key certification. Minimize our consumption of natural resources, especially water. This is why we installed in 2007 an automatic watering system for our garden. Minimize the waste we are creating, eg. by recycling as much of it as possible. Already we have recycle bins for use both by employees and guests for paper, plastic, glass, aluminium and batteries. Minimize the greenhouse gasses we are emitting, by becoming more energy-efficient. For example, opening a window will automatically make the air-conditioning stop. Invest in new energy-saving technologies, such as energy-efficient light bulbs and better insulation. In 2007 we already replaced most of our light bulbs with efficient Class A ones. More were replaced in 2008 and the remaining ones in 2009. In 2011 we installed solar panels for heating water, thereby seriously reducing the petrol consummed to warm water for our showers. Promote local cultural hotspots, by providing easily accessible relevant information to our guests. We invite you to have a look at our information board for this! 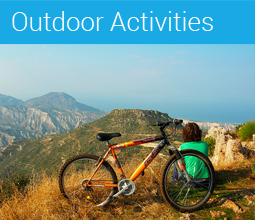 Contribute to local community initiatives, such as sports tournaments. 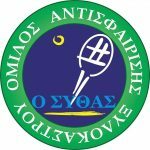 For example, we financially support every summer the annual Childrens’ Tennis Championship in Sykia; since 2006 we have been financially supporting the annual Panhellenic Tennis Tournaments that take place in Xylokastro. Promote local enterprise and employment, by employing local residents and using local businesses. All our employees are local residents. Support local environmentally conscious producers, by buying their products. Our breakfast buffet boasts delicious local seasonal specialities, such as oranges and grapes and locally produced organic jams. Promote diversity and gender equality. We train our personnel and ourselves non-stop on these issues! Avoid using your car. 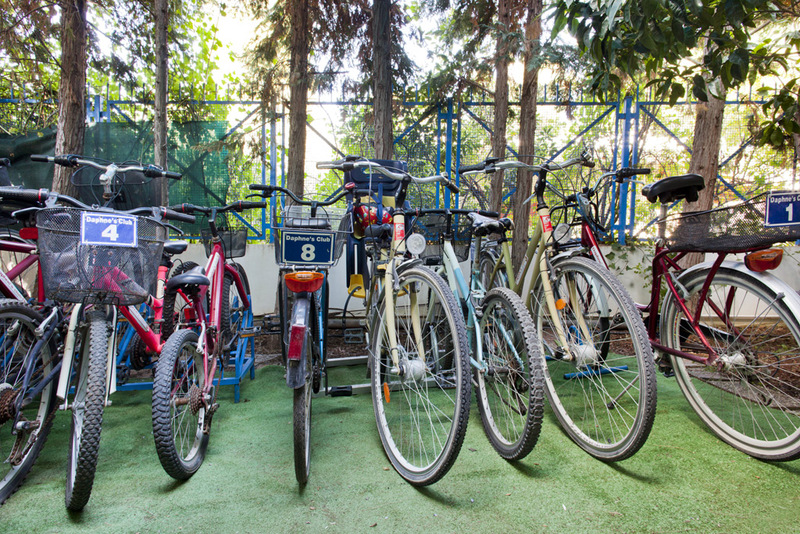 We will provide you with bicycles free of charge as an incentive! Download here (in English) Greenpeace’s proposal to create a marine reserve in the Corinthian Bay. On March 28th, 2009, Daphne’s Club participated for the first time in the global environmental event “Earth Hour”, by switching off the hotel’s lights for an hour. It was a most enjoyable hour, which we passed by the fireplace, playing music by candle-light. We are seriously thinking of having a daily “Earth Hour”!! To find out more about the Earth Hour click here . 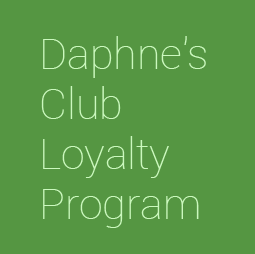 Daphne’s Club welcomes pet owners and their little friends with pleasure! Some rules, however, apply. Please read them here carefully before booking. In 2008 we created a “cat & dog feeding station” right outside the hotel. Here you can “recycle”your left-over food. It is much appreciated by passing cats and dogs!